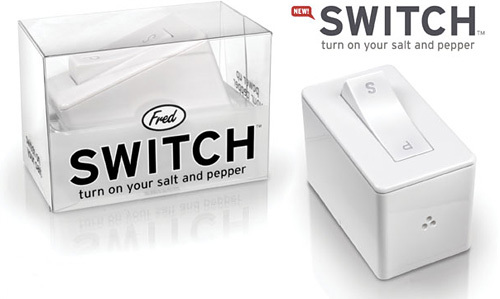 Switch Salt And Pepper Shaker | OhGizmo! Fred & Friends always seems to have a way of making their novelty crap rise slightly above the other novelty crap you find at stores like Urban Outfitters. As a result, not only do you feel slightly less guilty about giving their stuff as last minute birthday presents, but somehow you also don’t feel as bad about owning 17 different novelty ice cube trays. For instance, take this Switch salt and pepper shaker being introduced as part of their new 2011 lineup. There’s literally nothing wrong with the salt and pepper shakers I currently use, but for some reason I have the urge to chuck them out and replace them with this unified solution which uses a large toggle button on top for switching between shaking out pepper or salt. And while it’s no Peugeot pepper mill, the opportunity for hilarious hi-jinx when you swap the salt and pepper is really irresistible. Take that invited dinner guest suckers! Hahaha!